Haskell Small is an American pianist and composer with varied performing experience, often touring with his own works, and with acclaimed recordings including one of the music of Federico Mompou (MSR1282). He is Piano Department Chair at the Washington Conservatory of Music. Responding to the Tate Modern’s famous ‘Rothko Room’, with its collection of paintings from the artist’s late period Red series – the Seagram Murals, Small’s half-hour work is an ambitious structure which outlines Mark Rothko’s life. The opening is an ethereal, mystical atmosphere with bell-like sonorities. The temptation is of course to make comparisons with something like Morton Feldman’s Rothko Chapel, but this is a different world. The elemental is explored from about 10 minutes in with a driving rhythmic section portraying Rothko’s earlier interests in primitive art. The still atmosphere of the opening then returns, with sparse triads growing into a section which at times recalls Olivier Messiaen’s luminescence and sense of spiritual transcendence. This descends into the darker lower regions of the piano – beauty always struggling against a sense of doom, symbolising Rothko’s mental illness and ultimate suicide. The Rothko Room is a highly charged and moving experience which does indeed go some way towards generating the atmosphere which the Seagram Murals can create. I too have meditated for extended periods in this space when it was still in the old Tate Gallery, and the only issue with such a musical response is that it inevitably remains highly personal. Each of us will have our own associations with an artistic masterpiece, and by hanging a musical work so close to a single set of works we are always asked the question as to whether the sounds agree with your idea of what fits the images. Fortunately, this large musical canvas stands on its own terms, and even if they arrived at the concert too late to pick up a programme I would guess most listeners will recognise this as a powerfully atmospheric and potently expressed work whatever its initial inspiration. By contrast, Visions of Childhood is a set of short pieces, compared in the booklet notes to Robert Schumann’s Kinderszenen in the respect of their being “a grown man’s look back at childhood.” These are poignant and playful pieces, but by no means simplistic or really childish – the filter of sophistication is firmly fixed over the lightly Vaseline-treated lens, and these evocations conjure a wide variety of associations with a little help from the likes of Grieg or Martinů, perhaps even Scriabin, and indeed Schumann. These are however by no means pastiche sketches. Each piece has its own strong character and identity while retaining membership of the cycle – superbly crafted and played with admirably kaleidoscopic colours. The final piece, A Glimpse of Silence, is also the most recent. The booklet doesn’t reveal much about the work, though there is again an association with Rothko in his quote, “Silence is so accurate”. This is a piece which creates atmosphere and its own essence of beauty in sonority, though retaining a sense of the enigmatic – what is it saying? Do we need to know? Does there have to be a message? In these ways it poses similar questions to Rothko’s art. We can take these canvases on their own terms and feel their power, so why shouldn’t this be the case with a piece of music? 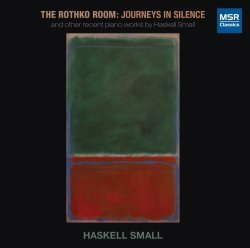 If you like the paintings of Mark Rothko and are looking for a soundtrack which resonates with his gently pulsing colour planes then this is a superb space to enter. Art aside, this is top-notch playing of some fascinating new and compelling piano works, and as such is self-recommending.